Modern and whimsical, this line flowers invitations is sure to impress your guests. This invitation, perfect for a Quinceanera, Sweet 16 or birthday of any age, features a choice of blue, green, lavender or teal background. 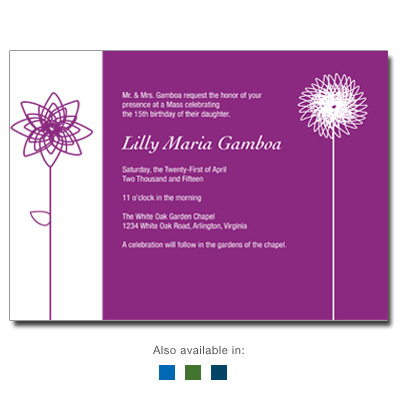 Two outlined blooms border the card on either side of your event information printed in white. Card measures 7 x 5.